Ghana Trip Update – Forensic Facial Imaging Abroad! 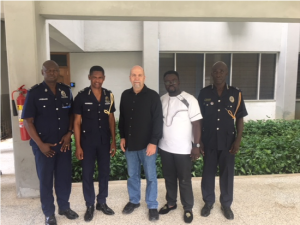 Last month, I travelled to Ghana at the invitation of Dr. Richmond Afoakwah, Department Head of the University of Cape Coast’s Department of Forensic Sciences. The university has built a robust program they continue to improve upon with help from the government and numerous grants. So far, they have built a well-stocked lab with equipment students can use to hone their skills in a variety of forensic science disciplines. I was invited to present my software, Frontalis® Facial Composite System and to introduce them to the digital tools needed to integrate forensic facial imaging into their instructional program. Up until then, I never travelled outside the continental United States. All I could boast was a couple of trips north to visit our Canadian neighbors. Now I had to get a passport, visa and a series of shots before I could even think about leaving the US. When I arrived in Ghana, I was taken-in by the beauty of the Atlantic Ocean. I found the people of Ghana to be hard-working, entrepreneurial and kind. Africa has an abundance of natural resources, many of which are shared with Ghana. While there, I enjoyed a trip to a rain forest, local hangouts and a coastal castle where slaves were processed before being shipped to the America’s both north and south, including the Caribbean. He also made sure that I was well-fed with native Ghanaian dishes that I found both delicious and spicy! Meanwhile, back at the university, I provided a short training program to faculty members interested in learning about using a software-driven approach to create facial composites. They were attentive and eager to learn. On Wednesday, October 31st, I gave a public presentation titled, Making the Move from Pencils to Pixels, touting the benefits of migrating from analog to digital. It too was well-received and well-attended. Finishing the business-end of my week, I took part in a faculty meeting where curriculum was discussed for a new degree program. High-ranking officials from the Ghana Police Service also attended. After I spoke about the benefits of integrating facial composites into their investigative protocol, they shared a story about how one of the only times they can remember using a facial composite resulted in an identification and arrest. In that incident, the suspect was described having a large gap between his upper-front teeth. It was significant enough to call-in an artist to create the facial composite. Hopefully, I was able re-ignite their interest and over time, they will adopt a nationwide approach to creating facial composites using Frontalis® Facial Composite System Software. With my work pretty much done at that point, the remainder of the week was spent taking in more sights and visiting the capital city of Accra. Like most major cities, there were historical sights to explore, government offices to see, major traffic snarls to wait patiently in and ONE more, spicy, Ghanaian dish to experience before returning to the US. But until I return, I will hold fond memories of Ghana, its people and all the new friends I made while there. PreviousPrevious post:Happy Holidays from SketchCop® Online AcademyNextNext post:Writing a book? Creating faces? Beware of writer’s block! Writing a book? Creating faces? Beware of writer’s block!